Working in a high rise building on San Vicente Blvd. in Brentwood, during the late 80s, I frequented the restaurant, Toscana. It was a block from my office and the maitre’d, Francesco Greco, always welcomed my guests and me warmly. He treated us as family with a friendly smile and a heartfelt hug. I usually ordered my favorites: Pennette alla Carrettiera with anchovies, olives, garlic, capers topped with a divine tomato sauce or the Risotto Ai Funghi Selvatici with a creamy Arborio rice and wild mushrooms. Both were always excellent. My clients were thrilled when the great Laker coach, Pat Riley sat next to us on day at lunch. Another time the actress Nicole Kidman sat across from our table. It’s a neighborhood favorite for many celebrities. My only complaint was their tiny waiting area. Since it was always filled at peak hours with loyal patrons leisurely enjoying an authentic Italian meal, guests waited outside in a breezeway until their table was ready. All that has changed. Bar Toscana recently acquired the gallery across the breezeway and has opened a delightful Italian bar serving small Italian tapas, priced between $7 – $16 and pleasing libations. My husband and I wanted to experience Bar Toscana since I am such a fan of the restaurant. I also wanted to see if my friend, Greco was still at Toscana. The sleek and modern lounge was filled with an enthusiastic crowd on a Tuesday evening. We took a seat on two bar stools at the attractive black, white and chocolate brown colored bar and ordered peach Bellinis. The menu states that Giuseppi Cipriani, at Harry’s Bar in Venezia, created the original Bellini in 1948. 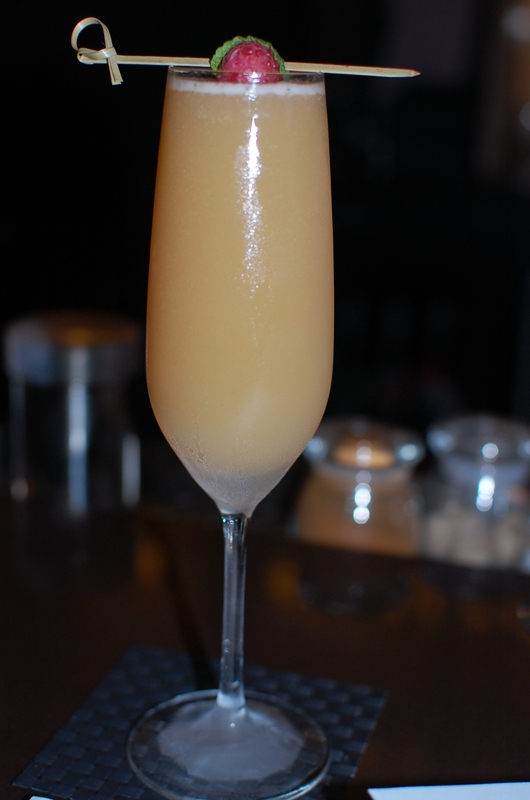 It’s a luscious combination of prosecco and a slightly sweet white peach puree. Our bartender/server, Nick, recommended the deconstructed pizza and the roasted veal for starters. 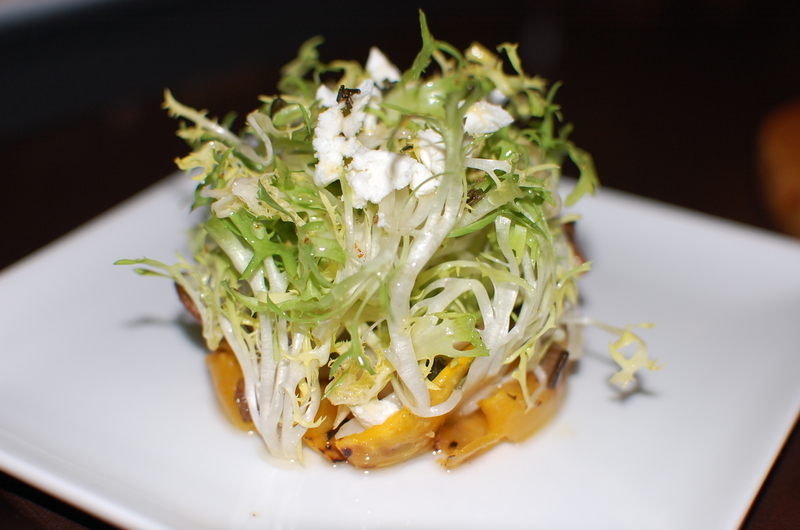 I had my eye on the Insalata di Zucca with roasted pumpkin. The salad arrived in a round mound of frisee lettuce with a layer of thinly sliced pumpkin on the bottom, grilled chanterelle mushrooms and goat cheese. The delicate oil and vinegar dressing allowed the ambrosia pumpkin flavor to dominate the dish. Next, the Struzzichino Toscano “deconstructed pizza” arrived with little squares of crisp Italian flat toast as the crust, a small jar of tomato jam as the sauce, and buratta, a blissful union of mozzarella and cream that produces a soft buttery spread. 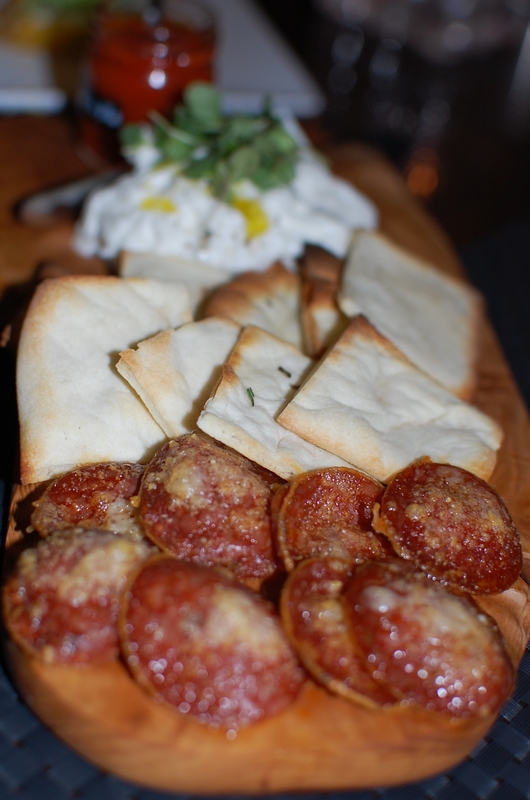 Lastly on the plate were crispy and zesty pepperoni slices. I opted to forgo the pepperoni and instead spread the crimson tomato jam and the rich buratta on the delightfully crispy toast. It’s an ideal snack with a cocktail before strolling across the breezeway for your dinner reservation. Just remember to drink up; you can’t bring your cocktail across to the restaurant. When the veal arrived I learned that it had been slowly roasted for two hours at 200 degrees to lock in the flavor and moisture of the delicately coral colored thinly sliced meat. It appeared with tiny dollops of a green caper sauce and roasted red peppers. Served with homemade chips with a sprinkle of rosemary and sea salt. A gentleman sitting next to us exclaimed, “the lasagna tonight is the best in town.” After ordering it, we agreed 100%. The Executive Chef Luca Crestanelli, a native of Verona, designed the menu and his lasagna appeared not in a square or rectangle shape, but round with layers of roasted artichoke, black trumpet mushrooms, truffle and Fontina cheese. This small plate is a heavenly light meal. The bar serves Italian spirits that you won’t find anywhere else in the city. They offer a variety of digestive and Grappas from various regions in Italy. The staff is extremely knowledgeable about the products they offer and will customize a drink to your liking. As we were leaving, Maitre’d Greco appeared from across the way to guide patrons to their table. Our eyes met and he gave me one of his amicable smiles and comforting embraces. I’m not sure if he really remembered me from fifteen years ago, yet he sure made me fell special and welcomed. After exchanging a few words, I promised that I would be back again. Their creative Northern Italian specialties are definitely worth another visit. Opened nightly from 5:30 p.m. to 11 p.m. 11633 San Vicente Blvd. (310)820-2448.